This is the 'cover page' for a web site devoted to the Russian Great Patriotic War of 1812 against Napoleon's invasion. Please go to Borodino for photos of the battlefield, museum and reenactors. And go to 1812 for a detailed chronology of the campaign. Here is a text description of the campaign and a bibliography. We are preparing maps of the campaign here. And go here to see several scenes from the 1999 reenactment. We have a review of the fine book, The Battle of Borodino, by Alexander Mikaberidze. We have views of the special exhibition in honor of Marshal Kutuzov in the Artillery Museum. We are adding material on Napoleon as well. We also have an extensive web site with several hundred photos of exhibits in the great Museum of Artillery, Engineers and Signal troops in St Petersburg from visits in 1991,2,3, 98, 2003 and 2005. 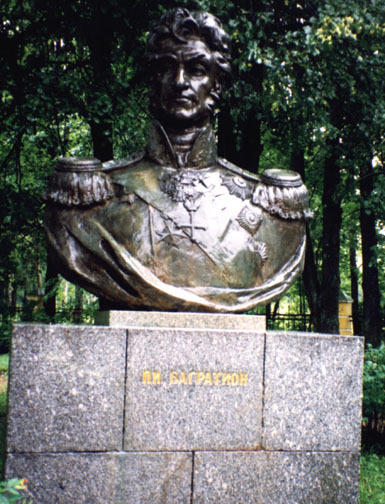 These include items from the 1812 campaign and an entire room devoted to Marshal Kutuzov. For material on fortifications in Russia and Ukraine please go to Fortress. For material on Russian history organized by city please go to Ruscity. For material on the uniforms and organization of the Imperial Russian army please go to Rusarmy. This directory isfor the Viskovatov illustrations of the uniforms of the army of Alexander I. For material on military history in general please go to military history. Material including illustrations on medieval Russian arms and armor is at armor. Material on Russian medieval rulers and modern emperors is at rulers. 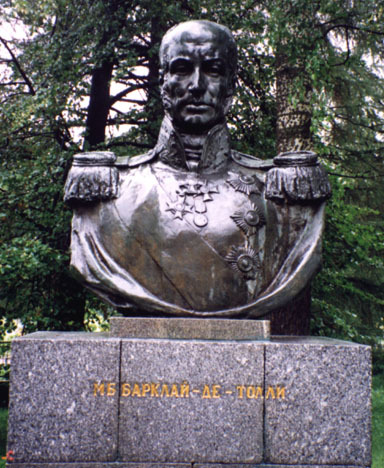 Here are photos of the busts of the two great Russian commanders - Barclay de Tolly on the right and Prince Bargation on the left. These pages last edited on 25 March 2009. Please send comments and questions including opportunities to join in future tours to the locations included here to Xenophon or sign our guestbook. For more material on the history of Russia and Ukraine please go to Xenophon home page.